Providence Point is a 55+ community located in Issaquah, Washington. This well-established active adult neighborhood was developed by the Swanson-Dean Corporation between 1984 and 2004 and has 1,008 attached and condominium homes. 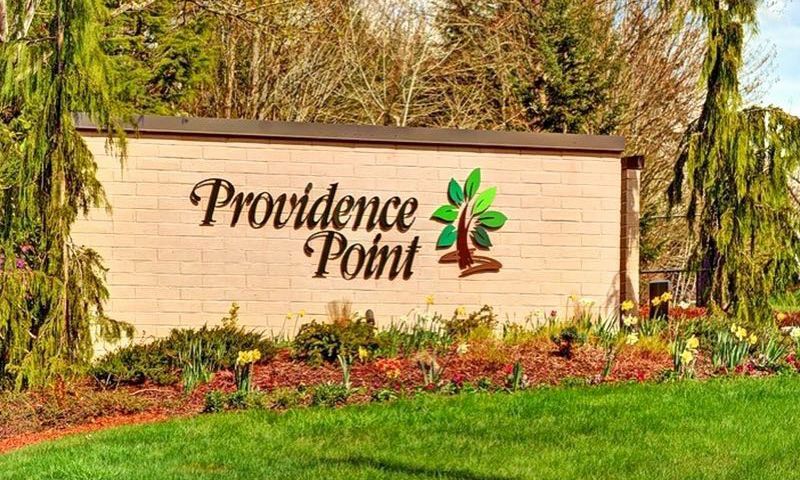 Providence Point is a highly desirable 55+ neighborhood thanks to its long list of amenities that include four community centers and several outdoor amenities that keep homeowners busy socially and active physically. Providence Point also benefits from a terrific location that is less than 20 miles from downtown Seattle. Issaquah also has several options for outdoor recreation, including Lake Sammamish, Cougar Mountain Regional Wildland Park, and Tiger Mountain State Forest, all just a short drive away from Providence Point. Providence Point has four community centers to keep residents engaged with the neighborhood. Providence Point's main clubhouse is where homeowners go to stay in shape with an indoor pool for getting in a few laps and an exercise room for breaking a sweat. Additionally, there is a multi-purpose room for community gatherings and a catering kitchen is on hand to prepare snacks for friends. The South Community Center has an aerobics and dance studio that regularly hosts group exercise classes like yoga and Zumba. Several meeting rooms make the South Community Center the natural gathering point for classes and events. The third amenity center, Town Hall, has Collin Hall for larger events and a smaller multi-purpose room. The North Community Center is the location of the community library where you can rediscover a classic book or find a new favorite. A craft room and meeting rooms are well-equipped to help residents discover a new hobby. In addition to the four community centers, Providence Point has an abundance of outdoor amenities. Miles of nature trails wind throughout the neighborhood, creating the perfect backdrop to an early morning jog. Residents can relax on the gazebo or challenge a friend on the putting green. The green thumb will love the Pea Patch gardening plots and for trips to town, Providence Point provides homeowners with a bus service to local destinations. Providence Point was developed between 1984 to 2004 and now has 1,008 attached homes and condominium units. Providence Point has a select number of townhomes available on a resale-only basis. These homes range in size from approximately 1,100 to over 1,700 square feet of living space and offer two or three bedrooms, one to three bathrooms, and an attached one or two-car garage. Residents love that these homes boast oversized kitchens, vaulted ceilings, private outdoor spaces, dens, and open floor plans. Providence Point is mostly comprised of condominiums. These units range in size from approximately 800 to over 2,000 square feet and offer one to three bedrooms, one to three bathrooms, and a detached garage. Homeowners love that their homes allow plentiful sunlight and have common areas perfect for entertaining new neighbors and longtime friends. Homeowners will also be delighted to know that the homeowners' association fee includes exterior home maintenance, garbage, sewer, security, cable, and landscaping, giving residents more time to enjoy a low-maintenance lifestyle that suits their wants and needs. Providence Point provides residents with a socially fulfilling lifestyle by constantly planning events and groups for several interests. These include a book club, food and wine society, potlucks, holiday parties, happy hours, and barbecues. Homeowners can develop a new hobby with clubs that range from quilters to drama to art. Staying in shape is fun with regularly scheduled yoga, Zumba, and water exercise classes. Providence Point also hosts wine tastings, book and art sales, and also hold concerts for residents to enjoy. Providence Point is located in Issaquah, Washington. The community is located next to everyday conveniences like Target, Costco, restaurants, and Lowe's. A movie theater is also down the street for catching a matinee. Providence Point is also near Interstate 90 and for farther travel the Seattle-Tacoma International Airport is approximately 30 miles away. For healthcare needs, the Swedish Hospital is just five miles away. Issaquah is a perfect town for the outdoor enthusiast. Just minutes from the community residents can explore Lake Sammamish, Squak Mountain State Park Natural Area, and Tiger Mountain State Forest. The historic downtown district makes for a great afternoon for shopping, dining, and theater going. The area also hosts exciting events like an annual art walk, wine walk, and holiday parties. Big city entertainment is just a short drive away since Seattle is just a short drive from the community gates. Active adults who want a 55+ community in the Seattle-Tacoma area will have everything they need in Providence Point. The clubhouse is where residents can get in a workout or join a community gathering. The South Community Building has several meeting rooms for group meetings and neighborhood events. It is located at 4400 Providence Point Place SE. Town Hall features an on-site restaurant and Collin Hall. It is located at 4135 Providence Point Drive. The centerpiece of North Community Hall is the library that even has a resident librarian on staff for all your reading needs. It is located at 4010 Providence Point Drive SE. Providence Point also has the following amenities scattered throughout the community. There are plenty of activities available in Providence Point. Here is a sample of some of the clubs, activities and classes offered here. Providence Point is mostly comprised of condominiums. These units range in size from approximately 800 to over 2,000 square feet and offer one to three bedrooms, one to three bathrooms, and a detached garage. These units allow plentiful sunlight and have common areas perfect for entertaining. Please Note: Floor plans are not available at this time. Providence Point has a select number of townhomes available on a resale-only basis. These homes range in size from approximately 1,100 to over 1,700 square feet of living space and offer two or three bedrooms, one to three bathrooms, and an attached one or two-car garage. Residents love that these homes boast oversized kitchens, vaulted ceiling, private outdoor spaces, dens, and open floor plans. Please Note: Floor plans are not available at this time. 55places.com is not affiliated with the developer(s) or homeowners association of Providence Point. The information you submit is distributed to a 55places.com Partner Agent, who is a licensed real estate agent. The information regarding Providence Point has not been verified or approved by the developer or homeowners association. Please verify all information prior to purchasing. 55places.com is not responsible for any errors regarding the information displayed on this website.